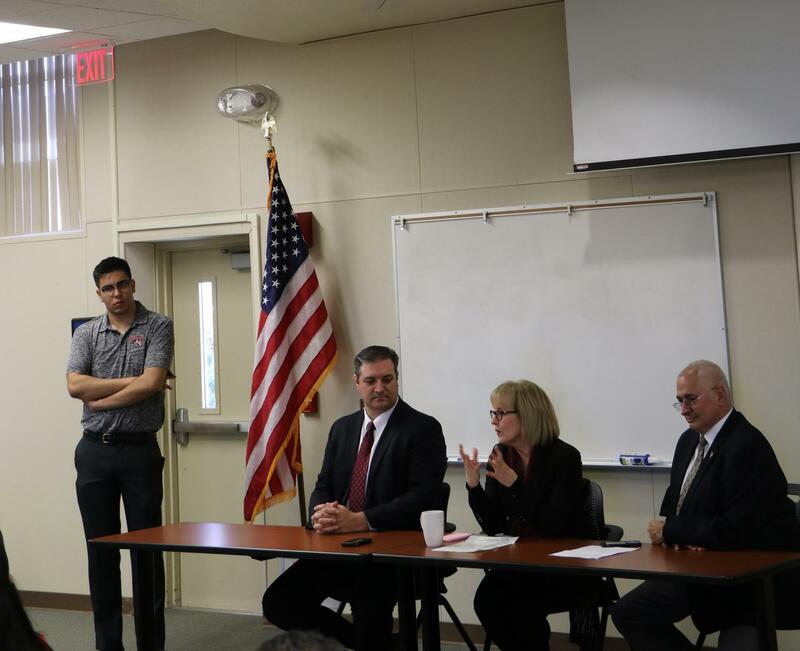 The Director of Legislative Affairs Mustafa Barraj (far left) facilitated the Power Lunch with Giacomini, Rozell, and Dadabhoy sitting beside him. 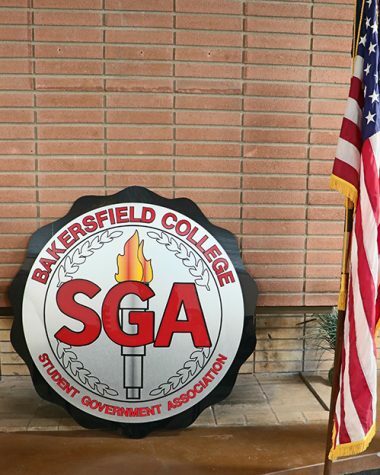 The Bakersfield College Student Government Association (BCSGA) hosted its first power lunch of the semester Jan. 16 in the Levan Center. 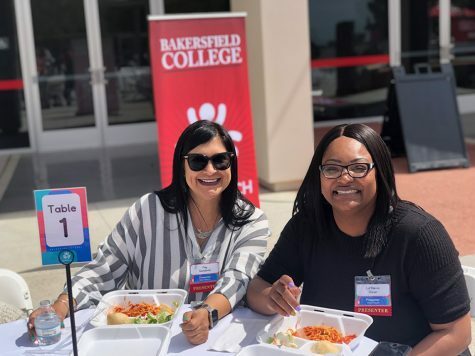 The Vice President of Student Affairs Zav Dadabhoy, the Vice President of Finances and Administrative Services Mike Giacomini, and Vice President of Instruction Liz Rozell are all part of the Bakersfield College Leadership. Giacomini, Rozell, and Dadabhoy sat down in the Levan Center to discuss their roles on campus. 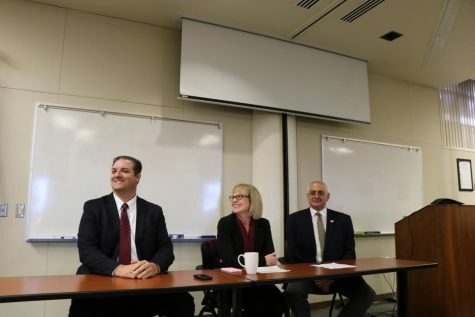 The three attended the Power Lunch and answered questions from students and faculty members. Director of Legislative Affairs Mustafa Barraj facilitated the event and directed prewritten questions to the BC Leadership about the specifics of their roles, the complications, and hardships they face within it, and how the Kern Community Colleges District (KCCD) Board of Trustees’ decisions affect their decision making. Giacomini oversees the college’s budgeting, maintenance, and operations. The construction under Measure J, food services, and public safety are also things he is responsible for. Rozell said her primary role as vice president of instruction is to determine community needs and develop partnerships with other academic institutions, industry or community partners. “We are out in the community, trying to determine what is it that the community needs in terms of programs,” Rozell said. She’s responsible for the curriculum development process at the college, along with the development of the college catalog, and scheduling classes to meet community needs. Dadabhoy’s responsibilities encompass a large portion of facilities that involve students. Financial aid, the admissions office, records, registration, graduation, scholarship programs, counseling, athletics, outreach, testing and placement, DSPS, EOP & S, CARE, CalWorks, academic support programs, student health, and veteran resources report to him. Roles with more responsibilities tend to come with challenges from time to time. For Rozell, having to be the mediator between people and trying to be the peacemaker was challenging and something she had to adjust to. Another challenge was the responsibility for the revenue brought into BC. 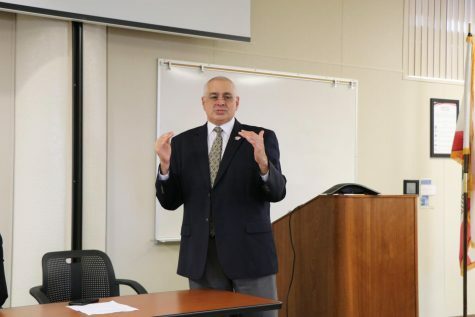 “There is a little bit of a pressure you feel is different than when you are a faculty member or a dean,” Rozell said. Challenges for Dadabhoy was the different hats he sometimes wore on the job and the complexity of working in a large organization where there are so many people to work with. 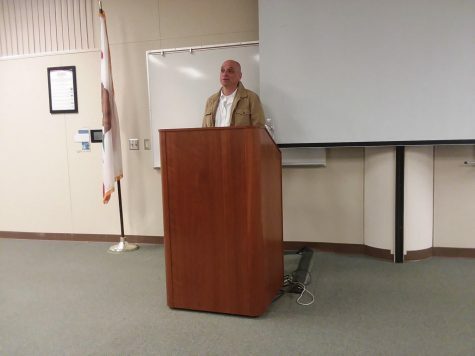 “I think that when it gets to our level, you can look at it one of two ways: you can say that everything is difficult, or everything is really an opportunity for some great outcomes,” Giacomini said. Zav Dadabhoy, the vice president of student affairs, spoke at the BCSGA Legislative Affairs Power Lunch in the Levan Center. 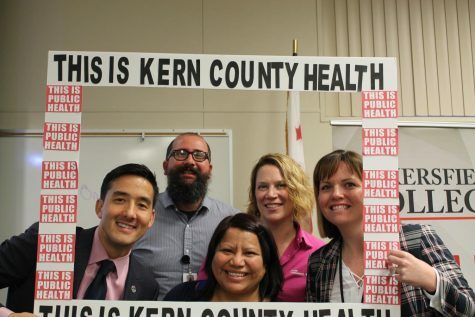 The KCCD Board of Trustees’ decisions impact whether something is going to happen on campus, and the process of approval can be long if not done in a timely manner. 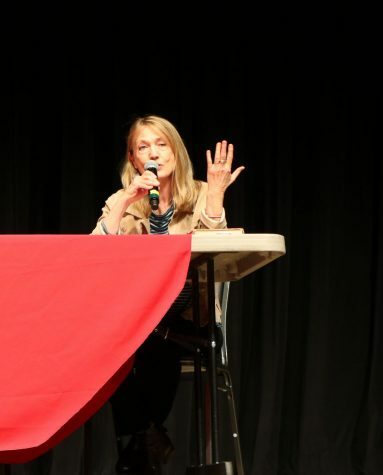 Rozell spoke how their decisions impact the school at the instruction and curriculum level because they ultimately decide what makes it into the curriculum, and any changes to it must be run by them and explained. “I like to look at our relationship with the board of trustees as a two-paged treaty. I think…there is authorization that we require from them for every single action that we do…” Dadabhoy said.